Among Thai people living in the United States, the phrase "Thai food" might inspire pride but it's the country's regional specialties that evoke yearning. Thankfully, Los Angeles has more Thai residents than anywhere in the world, except for Thailand. That means we've got a wealth of options beyond the usual soups and stir-fried noodle dishes. Not that there's anything wrong with those. We wouldn't kick a bowl of tom kha kai or a mound of pad see ew to the curb. They're delicious. 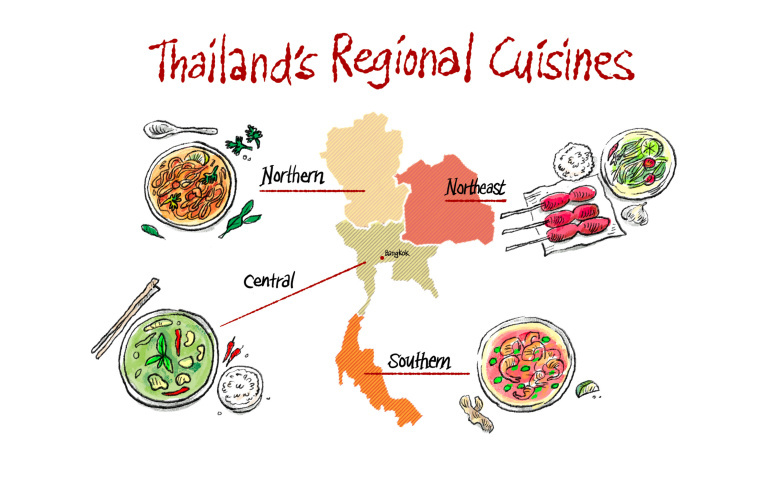 But they represent only a sliver of Thailand's four major regional cuisines: central, southern, northern and Isaan (in the northeast). 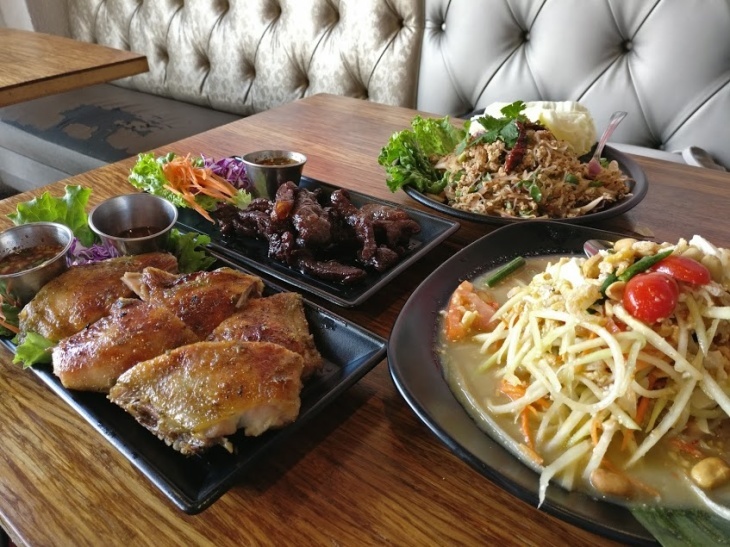 Fortunately, a trip to Thai Town in East Hollywood or to North Hollywood in the San Fernando Valley (yes, newcomers, they're nowhere near each other and yes, we do that just to confuse you) offers endless possibilities for pleasing your palate. Before we get into it, let's be clear: This is NOT a comprehensive list. Any list would be complicated by the fact that most Thai restaurants offer foods from multiple regions, especially when line cooks sneak a few signature dishes from home onto the menu. Consider this a nudge to try some northern chili dip, a spicy southern fish curry or some fermented sour pork. America's most popular Thai dishes — pad thai, tom yum, the red/yellow/green curries — originate in Thailand's central region, home to the culinary wonderland that is Bangkok. The cuisine here features steamed jasmine rice, stir fried vegetables, seafood, soups and the frequent use of coconut milk and other sweet flavors, as well as the aforementioned noodles and curries. When it opened in the 1970s, Yai was one of the first Thai restaurants in the neighborhood that would become Thai Town, and it remains one of the oldest surviving Thai restaurants in L.A. A central Thai meal here should feature a balance of stir-fries and soups, meats and vegetables. As your vegetable, try the stir-fried Chinese broccoli, either with crispy pork or salted fish. Pair that with a duck or boar red curry and a beef tendon soup or the lighter gaeng jeud, with clear broth. Make sure to scoop plenty of steamed jasmine rice onto your plate. Located off the Hollywood Blvd. exit on the 101, Yai is the epitome of SoCal cuisine: a strip mall gem that shares space with a donut shop and a 7-Eleven. 5757 Hollywood Blvd., Thai Town. 323-462-0292. Hollywood Thai — in Thai, its name is "Khao Tom Hollywood" aka "Hollywood rice soup" — is a popular late night spot with younger Thai American immigrants. Follow their lead and order rice soup or rice porridge with sides of cha-om (acacia leaf) omelette curry soup, preserved turnip omelette, duck stew, or stir-fried morning glory with crispy pork. Whether you're trying to prevent a hangover, already nursing one or just chowing down, Hollywood Thai will nourish you with salty, soupy, stir-fried goodness. 5241 Hollywood Blvd., Thai Town. 323-467-0926. In contrast to the sweet, mild and creamy foods of central Thailand, Northern Thai cuisine embraces more of the bitter flavors found in herbs and offal. These ingredients are reflected in northern style laab (which seasons minced pork with spices like nutmeg, cardamom and star anise), sausages, salads and chili pastes. Sticky rice features much more prominently. The north also borders Burma (Myanmar), and that influence can be seen in dishes such as khao soi, a curry-like soup with both boiled and deep fried egg noodles. Just a couple blocks south of Thai Town, Spicy BBQ occupies a strip mall so tiny you have to leave the restaurant to use the bathroom. It's also the place to sample northern Thai style nam phrik chili dips, which you can eat as an appetizer or as part of a larger meal. Grilled green chiles go into nam phrik num while pork and red chiles go into nam phrik ong. They're listed on the menu as "grilled serrano dressing" and "ground pork chili paste," respectively, and served with fresh green vegetables and giant pork rinds. Spicy BBQ also offers northern Thailand's greatest hits including tam khanun, the spicy jackfruit salad, pounded in a mortar and pestle with pork, shallots, chiles and makrut lime leaves; sai ua, a northern style herbal pork sausage seasoned with lemongrass, chiles and turmeric; khao soi noodles; and gaeng hanglay curry, pork stewed in a blend of Indian-style spices brightened with the sweetness of pineapple and the tartness of tamarind. 5101 Santa Monica Blvd., East Hollywood. 323-663-4211. On the western edge of Thai Town, Pailin keeps its northern cuisine secret and off-menu except for a few hints in the "chef's recommendation" section. Ask politely and you'll discover that they offer chili dips, jackfruit salad, northern style sausage and khao soi. Their kanom jeen nam ngiao, a savory pork and tomato soup with fermented rice noodles (the fermentation only affects the texture), almost evokes an Italian pasta — if it were lined with flavor bombs comprising pork blood cubes, fried garlic, and pickled mustard greens. 5621 Hollywood Blvd., Thai Town. 323-467-6775. Venice: first lunch service happening in 10 minutes! Come through for some Khao Soi Rib. Chef Kris Yenbamroong is a native son of Los Angeles, a second generation Thai American whose parents started the restaurant Talesai. In 2010, he spun off his own concept, Night+Market, which now has three locations: Silver Lake, Venice and West Hollywood's Sunset Strip (the location names "Song" and "Sahm" are Thai for "two" and "three"). Although Yenbamroong has no formal culinary training and doesn't aim for a rigorous sense of regional purity, his menu bleeds northern Thai cuisine, especially at the WeHo location. While his food reflects diverse regional influences, his Chiang Rai style larb lanna, sai uah sausage and khao soi noodles are quintessentially northern. You can smell those herby aromas in his sai uah and taste it in the subtle bitterness of the pork blood and spice mix in his larb lanna. Night + Market WeHo: 9043 Sunset Blvd., West Hollywood. 310-275-9724. Night + Market Song: 3322 W. Sunset Blvd., Silver Lake. 323-665-5899. Night + Market Sahm: 2533 Lincoln Blvd., Venice. 310-301-0333. Southern Thai cuisine features seafood, tamarind and coconut milk as well as a spicy "wet" heat that's common in its curries and stews. It also glows gold thanks to spices like turmeric, which came eastward from South Asia with the Muslim communities who now live along Thailand's southern peninsula. One of the best known Thai spots in Los Angeles thanks to Jonathan Gold's adoring reviews, Jitlada has a ridiculously deep menu with a lengthy section dedicated to southern Thai classics like khua kling, a dry-roasted curry with ground meat; khao mok gai, Thailand's version of chicken biryani; and khao yam, a rice salad mixed with dried shrimp, mango and shredded coconut. Order at least one of Jitlada's stellar curries, which are so hot they might melt your face off. Their famous jungle curry is an herbacious brew tinged with grachai (a root related to ginger and galangal) and makrut lime leaves while the gaeng tai pla, a curry made with fish innards, delivers a complicated salty and savory flavor that comes from fermenting the fish before simmering it with Thai eggplants and long beans. The crab curry and southern curry are also great choices. Round out your meal with pork or eel with sator beans, also known as stink beans, a signature ingredient in southern Thai cuisine. As a bonus, look around the restaurant and you might spot sketches by The Simpsons creator Matt Groening, who's another major Jitlada fan. 5233 Sunset Blvd., Thai Town. 323-667-9809. Chefs Fern Kaewtathip and Noree Pla of Luv2eat both hail from Phuket, which — aside from its role as a tourist destination and punny t-shirt fodder — is a province and island in southern Thailand. Two of their signature dishes: the Phuket style crab curry (served with rice noodles), and the Hat Yai style fried chicken (served under a mountain of fried shallots). It's a great place to go if you're in mid-Hollywood and you need to head in a direction other than east to Thai Town. 6660 Sunset Blvd., Hollywood. 323-498-5835. The Isaan region, in Northeastern Thailand, shares a border, a language and a culture with Laos. You can see the way the two countries influence each other in dishes like laab and papaya salad. 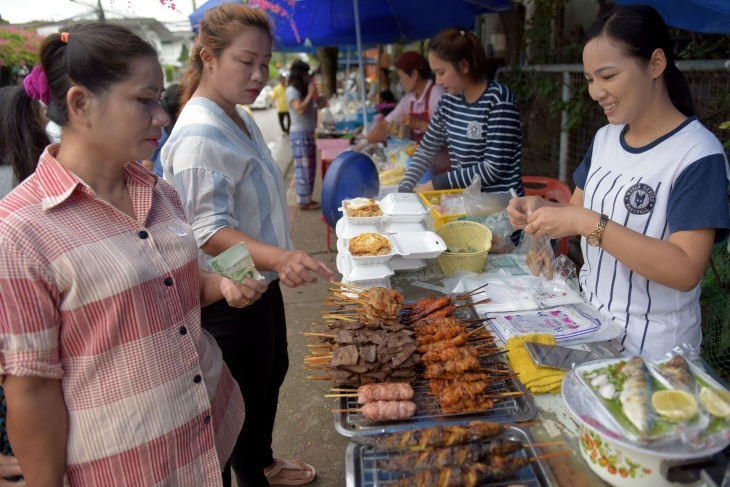 Fermented sausages, grilled meats and sticky rice are all quintessentially Isaan foods. The spiciness here is more of a dry heat, derived from dry-roasted and crushed chiles. Strong, funky and savory flavors from fermented fish pastes are cut with the acidity of limes, creating the salty/sour/spicy symphony that's at the heart of Isaan cuisine. Located on the northeastern edge of Koreatown, Isaan Station offers one of the best selections of Isaan-style grilled meats. Their grilled chicken, dad diew-style jerkies and crying tiger grilled beef go well with the tart and salty nam jim jaew dipping sauce, made with fish sauce, lime, tamarind, palm sugar, shallots, toasted rice and chili flakes. Isaan pork sausages, fermented pork spare ribs and nam tok beef or pork come saturated in those sour and salty flavors. Isaan Station also serves laab with glass noodles that soak up any leftover lime and fish sauce. Pair their meats with sticky rice and a papaya salad for a classic Isaan meal. There's valet parking in the shared lot and lots of street parking nearby. They're closed on Mondays and between 3 and 5 p.m. on other days. 125 N. Western Ave., #111-112, Koreatown. 323-380-5126. Som tum is Thai papaya salad and, as the name Lacha Somtum suggests, it's their speciality. Papaya salad, which you can get with all sorts of add-ins — salted crab vermicelli, crisp pork, salted duck egg — is the star of the show. The deep-fried papaya salad is a decadent papaya hash brown that arrives as one large, golden mass with peanuts, long beans and sauce on the side, so the dish stays crisp. 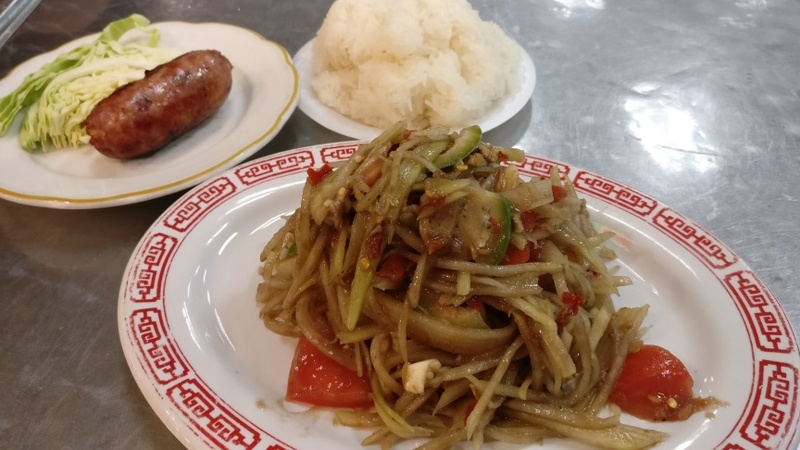 You can also try the som tum with nam khao tod (sour sausage tossed with crisp, fried rice) or yum pla dook fu (fried ground catfish seasoned with lime and fish sauce). If you're driving, give yourself ample time to find street parking. The adjacent Thai Town lots are quick to tow anyone who shouldn't be there. 5171 Hollywood Blvd., Thai Town. 323-486-7380. The restaurant's Thai name, Song Fung Khong, roughly translates to "both sides of the Mekong River" and alludes to the language, culture, and cuisine shared by Thailand's Isaan region and neighboring Laos. At Kim Thai, that means leaning into the savory funk of padaek, a fermented fish sauce made from freshwater fish and the spicy heat of dry roast chilis. Their Lao style papaya salad incorporates that darker briny fish paste instead of fish sauce while their duck laab is served with duck cracklings. Beyond those standouts, Kim Thai Food has a nearly endless menu with bamboo shoots, savory soups and even ant eggs. Find them inside the food court at La Fiesta Swap Meet. 12727 Sherman Way, Ste. B-07, North Hollywood. 818-765-5584.